Gund has been creating unique teddy bears and other soft toys for well over 100 years. Recognized the world over for their quality and innovation, Gund's award winning products appeal to all ages, from infants up, and are perfect for both play and collecting. 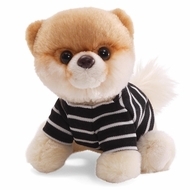 The Itty Bitty Boo collection features the World's Cutest Dog all dressed up. They are too cute to resist and you will want to collect them all.